Men’s Apparel and Uniform Clothing for Promotional workwear, event gear, team wear and merchandise. The Harriton Foundation 100% Cotton Twill work shirt is the right choice for your active staff. Workwear has come along way and this long sleeve shirt with TeflonTM coating makes your staffing uniform needs more durable than ever before. Add your logo to workwear with custom embroidery. The classic Canadian brand Roots73 is a fit for a style conscientious corporate or sales teams and when you need warmth and comfort the Bridgewater Insulated Jacket with a detachable hood will put your business image out front. Add your logo to this parka style coat with fishtail hem, critical seam sealing to keep out moisture and a waterproof, breathable membrane. Quality and Performance meets Affordability and Comfort with the DRYFRAME® Thermo Tech Hooded Jacket is a product! This modern lightweight winter jacket utilizes breakthrough thermal lining technology keeping the jacket light but still warm for a brisk fall or winter morning. It’s the right product for your team with custom embroidery and your business logo. Price point is why the Canada Sportwear Soft Shell Jacket is a popular promotional apparel item, but the quality is why customers keep coming back. The Navigator is a jacket you can use year round and with custom embroidery of your logo, you can’t go wrong! The Motivate Lightweight water resistant Jacket is the perfect companion to start fall and stay fresh in Spring. Custom embroidery or Heat Seal* your logo on these jackets to get your business recognized. *Contact us for pricing. Look sharp this summer in custom polo shirts for a very affordable price. This easy care short sleeve polo is an excellent choice for workwear, an event or maybe your charity golf team. You can bring a corporate image to your crew this summer and get ready for success. The classic styled Authentic T-shirt Company tee is the latest success to their line of custom apparel for printed team, sports and event wear. Plus it's one of our lowest priced T-shirts! That's right, you can brand your logo with embroidery on men's Nike Golf Apparel! We can have you and your team looking your best on the golf course for charity golfing tournaments this summer. The Stirling short sleeve dress shirt (tall) brings a trendy retail look to business apparel! If you need a corporate spring and summertime uniform for trade, food and beverage, hospitality, sales and office work this short sleeve number is a workhorse for workwear for most workplaces. Look smart with your logo on promotional dress shirts. Tall sizing provides an additional 2″ in the length of the body and the sleeves. The Stirling short sleeve dress shirt brings a trendy retail look to business apparel! If you need a corporate spring and summertime uniform for trade, food and beverage, hospitality, sales and office work this short sleeve number is a workhorse for workwear for most workplaces. Look smart with your logo on promotional dress shirts. The Wilshire dress shirt is a must for your corporate and sales teams. An active shirt built for variety in the workplace which is a must for modern uniforms. 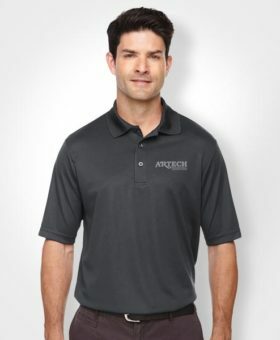 Add your logo to workwear that turns heads and impresses employees.